Do you have Cisco 7965G IP Phone in your office and looking for a headset? Do you own iPhone or other smartphone, which came with a single plug headset? What if we tell you that you can use it with your office phone? 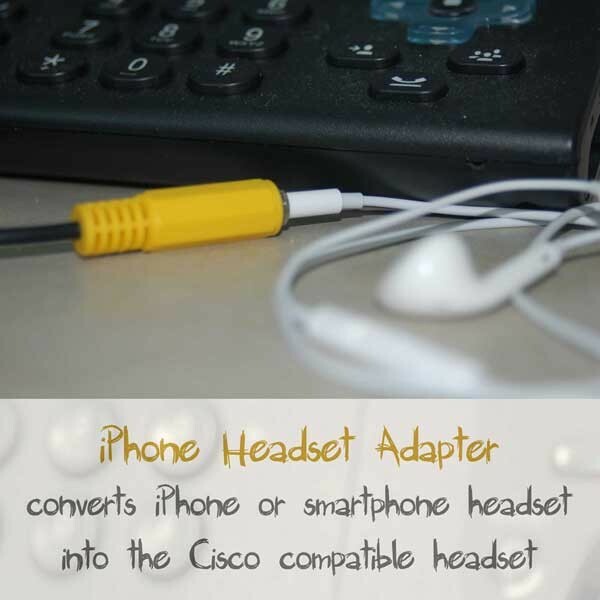 iPhone Headset Adapter converts an ordinary iPhone or Smartphone headset into a Cisco 7965G compatible headset. This headset adapter converts the audio headset with single TRRS 3.5mm audio plug into the RJ9 modular plug that connects to the Cisco 7965G Unified IP Phone (see our Headset Plugs FAQ for references). This solution offers you great flexibility to choose a headset you prefer. For example, you will be able to use your existing iPhone headset that you could have already. Or purchase comfortable computer headset with iPhone-style plug. You can choose between behind-the-neck and boom-style headset. And you continue to use the same headset with your smartphone. Our headset adapters allow you to use full functionality that Cisco 7940 Unified IP Phone provides. You will be able to answer a call with either headset or handset, and you can switch between them during the conversation. You may use Auto-Answer with the headset or the handset. You will be able to store volume settings separately for speakerphone, handset or headset. These adapters are compatible with hearing-aid in-line amplifiers. To connect a headset Adapter to the Cisco Unified IP Phone, attach it into the Headset port on the back of the phone.